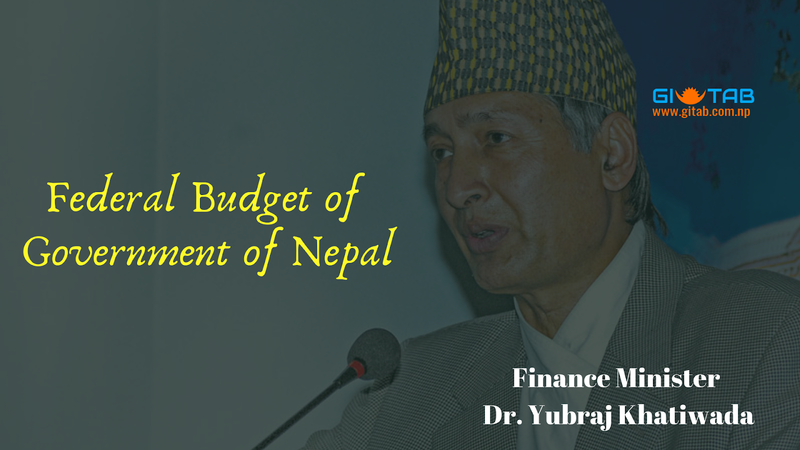 Finance Minister Dr. Yubraj Khatiwada presents the full federal budget of the Fiscal Year 2075-76 to the Parliament with the long-term objective of "Prosperous Nepal, Happy Nepalese". Please Read/Download Full Federal Budget Speech of Fiscal Year 2075-76. To end extreme poverty, impoverishment and backwardness by expeditiously fulfilling minimum basic livelihood needs, which are fundamental rights of citizens. To achieve rapid economic and human development by enhancing and optimally utilizing resources, opportunities and potentials. To build a prosperous, strong, self-reliant and socialism-oriented economy by developing economic, physical and social infrastructure. Promotion of sectors that can create jobs and employment opportunities for all citizens. Accelerated human development through the development of the social sector, including health and education. Use of capital, technology and research in sectors, such as agriculture, water resources and tourism, to achieve sustainable, broad, equitable and high economic growth. Development of basic and modern physical infrastructure, such as roads, railways, irrigation, electricity and urban facilities, to accelerate the pace of building modern Nepal. Enhancement in quality of public service delivery, and good governance perceivable by the citizens. Allocation of Budget of Rs.3.10 billion for The Prime Minister Employment Program to create more employment opportunities within the country in order to gradually develop such situation that does not require Nepali to seek foreign employment. In order to attract youths in business having higher education, the arrangement has been made to provide loan up to Rs. 700 thousand with a 5 percent subsidy in interest rate against the collateral of academic certificates. Compulsorily provisioning of credit guarantee and insurance of the business. Provision of providing project-based loan up to Rs. 1 million after accreditation of skill for the business for the youths returning from foreign employment. Compulsorily credit guarantee of such loan and insurance of the enterprise is proposed. One health center will be established in every ward within two years with the partnership of local level governments. Rs. 4 billion grant has been proposed to the local level to build such institutions. The government will bear the cost of health insurance premium up to Rs. 100 thousand of insurance amount for all citizens of over seventy years of age. Visit Nepal 2020 campaign will be launched with an objective of bringing 2 million tourists in the next two years. Internal tourism promotion campaign will be launched with the spirit of Country First Then Abroad. Rs. 5.2 billion has been allocated for tourism sector development. Prime Minister Agriculture Modernization Project will be expanded and Rs. 4.77 Billion has been allocated for the same. 75% grant shall be provided against insurance of Fishery, Agriculture & Animal husbandry. Visit Nepal 2020 program will be conducted which will aim to the entry of Rs. 2 Million tourists in the country. Feasibility Study & DPR is aimed to be conducted for various rail connections and water routes. Life Insurance limit to the Govt. Employees have been increased to Rs. 0.2 Million and 50% premium for the same shall be contributed by the Government and the Annual Uniform allowances to the employees have increased to Rs 10,000 each. The FY 2018/19 will be celebrated as the National Sanitation Campaign Year to ensure access to basic sanitation to all Nepali citizens within next three years. Nepal will be declared an open defecation free country by constructing toilets in all households. Proposals to celebrate the period of the 2018-2028 year as Energy Decade. Madan Bhandari Highway from Shantinagar of Jhapa to Rupaal of Dadeldhura district will be expanded to Patapur of Mechi Municipality to be developed as agriculture, commercial and industrial corridor to Chure and the valley of Inner Madhesh.